This Every Day book is really, really good. I mean it's really good. All the recipes I've tried from it so far have been fab, and there are still dozens more I want to try. Bill rocks! Speaking of Bill, and his rockingness, does everyone in Melbourne know that Bill's doing a lunch at the Stokehouse with Anthony Musarra next week to launch Every Day and the latest series of bills food? I heard about it in the latest issue of Delicious magazine, (which, incidentally, came with a free Bill DVD - fabulous), but sadly, the lunch is already booked out. Are any Melbourne bloggers going? If so, take some photos and let me know how it goes! But back to Bill, and last night's dinner. I made his ricotta and herb-stuffed roast chicken, served with corn and french beans. I also added a tomato salad because we'd bought some lovely ripe tomatoes which I thought would be perfect with this meal. 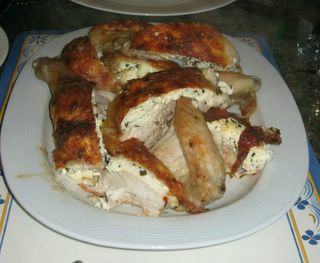 Bill's chicken is butterflied, with a herb-and-ricotta mixture stuffed between the skin and the meat. 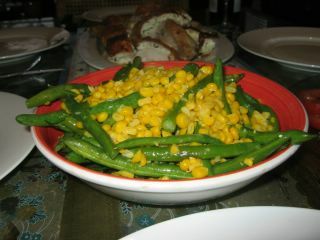 It takes 50 minutes to cook, which gives you more than enough time to make the beans and corn. To prepare them, it's simply a case of turning fresh corn kernels and green beans in a pan with butter, oil and sliced spring onions, pouring some stock in, and letting it cook until the beans are bright green and tenderly crisp. Ta-dah! The dinner was great! The chicken was super-simple and totally impressive. 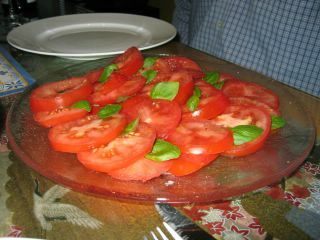 I whipped this up for a weekday dinner (very simple recipe, thank-you Bill! ), but it's fancy enough to serve to guests. Most importantly, it tastes fantastic. I love this book too - I have made the peanut butter choc chip cookies too, and also the caramel salmon, which was very nice as well. I am cooking through Jamie's new book at the mo, which means I don't try as many of other people's recipes as usual, but I still have my eye on Bill's yummy looking food. Sadly it is getting cold here and Bill suits our summer weather better, but never mind! Wow - chicken with stuffing under the skin?! Looks amazing. I'm a huge Bill fan too, I nearly always make something of his from the Delicious Magazine very month. One of most favourite dishes of his would have to be his recipe for dahl - from Simply Bill if you have a craving for Indian lentils then this is THE dish!